The southernmost offensive of Silberfuchs (Silver Fox) was constituted by the 3rd Finnish Army Corps, which would attack from Suomussalmi along the road through Kiestinki to cut the railway to Murmansk in the town of Louhi. Although not part of Silberfuchs, just south of the 3rd Finnish Corps, the 14th Finnish Division would attack from the Kuhmo sector in central Finland, along the road that runs through Rukajarvi to the railway north of Karhumaki. This would provide flank protection to the 3rd Finnish Corps. The 3rd Finnish Corps had a bigger title than it deserved because it only had the 3rd Finnish Division, a force the size of a brigade called "Division J" and the 8th and 9th Border Guards Battalions. However, it was commanded by one of Finland's finest generals, Hjalmar Silasvuo, who had led the Finnish forces in the epic victory at Suomussalmi in the Winter War. It had to attack from Uhtua to Kiestinki and then cut the Murmansk railway in Louhi. The terrain was a dense forest similar to that of Kuusamo, although the Finnish forces, slightly equipped, were much better prepared to advance without roads. In the summer of 1941, the direction of Uhtua was quite special. The Group (Ryhmä) Fagernäs (since September 3, 3rd Division), commanded by Colonel Uno Fagernäs tried to advance quickly to Uhtua. The ground was largely unfit for transit and the small roads were in a miserable condition. There were many overflow channels, but they were also used as vias of communication. No wonder the Finnish troops were stuck in front of Uhtua. The German Military Command had sent there as reinforcement the 3. / Pz. Abt. 40 commanded by Oberleutnant Walther, who was to march on the Raate road no later than June 25, 1941. The armored company, which comprised the HQ, two combat Platoons (10 tanks) and maintenance echelon, was attached to the Finnish Light Detachment 5 and the group was called Detachment Fossi by the nickname of its commander Major Alfons Järven. The intention of the Fossi Detachment was to launch rapid and deep attacks in the direction of Vuokkiniemi. The Fagernäs Group began its attack against Vuokkinieme on the 1st of July in the morning. The Finnish border was crossed and the Fossi Detachment continued to move from Latvajärvi in the lead of the Group. Latvajärvi - Vuokkiniemi, 1st to 3rd July 1941. The bridges on the east side of the village of Latvajärvi remained intact. After the capture of Latvajärvi, the Fossi Detachment (Light Detachment 5 reinforced with the 3. / Pz Abt 40) was ordered to penetrate towards the depth, targeting the village of Paahkomienvaara (approximately 24 kilometers). One of the light tanker trucks caught fire, one man was killed and two were injured. The village of Paahkomienvaara halfway between the national border and the village of Vuokkiniemi was reached around 17:00 hours without any contact with the enemy. Until that moment, the road traveled from the starting point was about 37 kilometers (and 25 kilometers from the border), so the Fossi Detachment had to stop. However, that same night, the Fossi Detachment continued its advance at 23:00 hours towards the new tobjective, Aijonlahti, 15 km away. During the night march, an enemy patrol fired at the commander's car of the Light Detachment 5, causing the loss of two officers who were injured. Several of the tanks were stuck in a swampy area at dawn on July 2 and could only be released with the help of the engineers. Oberleutnant Walter, appreciated that the trip could be traveled in about 14 hours. Elsewhere, the Fossi Detachment arrived in Aijonlahti at 03:30 hours on July 2, 1941. While Detachment M (I./JR 11) continued the attack that stopped on July 2, 1941 at 17:00 hours southwest of Kenäsjärvi, proceeding with the attack the 1. / JR 11 reinforced with tanks penetrated in Vuokkiniemi on July 3, 1941 at 01:00 hours. The enemy withdrew from the town after presenting a weak resistance, the population that had fled to nearby forests during the fighting returned during the morning. Detachment M continued on its way from Vuokkiniemi on the western side of Ylä-Kuittijärvi north towards Vuonninen, the bridges north of Vuokkiniemi were cleared and their repair took time. Advance to Vuonninen - July 1941. The village of Ponkalahti was captured after fierce battles on July 4, 1941. Upon leaving Ponkalahti, Fossi Detachment (Light Detachment 5 reinforced) returned to the lead. In the minefields, the Finns suffered increasing losses and, in addition, the enemy air force began to increasingly support the defense by bombing. The march of the armored vehicles from Vuokkiniemi to Vuonninen was very difficult. The road was almost impassable. South of the river, the bridge over Hirosvirta was destroyed by the Soviets. The Finns warned their brothers in arms that a bridge, which had been temporarily repaired, would not withstand the weight of the tank. The Germans did not believe, and consequently a Pz Kw III took a cold bath in the river water and a fierce dispute arose. The Finns won the argument because it was demonstrated that they had warned about the matter. Colonel Malm (JR 11 minus the 2nd Battalion plus the armored company W) received on July 5 the task of conquering Vuonninen and maintaining it. Aajuolahti was captured on July 5, Oinasniemi on July 5 and the stream line 3 kilometers south of Vuonninen was reached on July 7 after a week of difficult progress. The armored company W could not continue beyond Oinasnieme due to the need to improve the terrain and repair the vehicles. It was very important to quickly conquer Vuonninen, center of the enemy's bridgehead, where the new main service road under construction Juntusranta-Lonka and the main advance route of the Group (Ryhmä) F coincided with the course of the Kursmajoki River. After hard struggles and losses, the enemy was forced to leave Western Vuonninen, which was destroyed, as well as the bridges north of it. The I. / JR 11 at the head fell under heavy artillery and mortar fire, reached the burned village north of Kursmajoki on July 9, but the first capture attempt failed due to an enemy counterattack supported by artillery. The next day the III./ JR 11 reached Vuonninen on the western bank of the river. Prior to this the enemy was forced to abandon his positions in front of Detachment H about 6 kilometers northwest of Vuonninen and retreated completely north of Kursmajoki from July 10, 1941. Patrols were also deployed along the north coast of Lake Kuittijärvi to the village of Jyvälahti, which was found occupied. The first operational objective of Group F, and at the same time the limit of the enemy's delay zone, was reached on July 10. The average advance speed of the main forces was about 10 kilometers per day, so the troops were quite exhausted. Advance beyond Vuonninen - July 11 to 19, 1941. Colonel Fagernäs's plan of attack crystallized after performing tactical and technical intelligence. He absolutely wanted to achieve a surprise crossing and therefore chose Melkajanlahti as the first place to cross. A simultaneous attack in the north, locally from the left, would distract the enemy in the direction of the road, so that the attack in the southern section could break the enemy's positions in Korpijärvi, thus creating opportunities to destroy it between Vuonninen and Korpijärvi. The landing party would traverse or attack the two natural defense positions of the enemy's main line at Vuonnisenjoki and Pistojoki-Korpijärvi. General Siilasvuo approved the plan on July 10. Group F would also employ the JR 32 (excluding the 1st Battalion), the Sissi 3 and 9 battalions. Only the I./JR 32, which was building the road in Kursmajoki west of Vuonninen, remained as an army reserve. On July 11 the High Command set as the next objective of Group F, Enonsuu - Uhtua. Group F was largely restricted by the fact that the movement of troops from the west side of Vuonninen to the crossing point was not possible due to enemy fire. Therefore, the grouping of the troops followed more or less the configuration of the attack compartments. The attack was scheduled for July 14, 1941 at 02:00 hours. At 01:00 hour, the artillery and light mortars began firing on the enemy positions behind Vuonnisenjoki, and the German dive planes attacked in three waves every 15 minutes on three hostile targets. At 02:00 hours, began the attack of III. / JR 11 and the III. / JR 32 under the leadership of Colonel Malm from the Vuonnisenjoki crossing points north of the main road. In Melkajanlahti, at the same time, the crossing of the Vuokko Detachment began with 14 assault boats supported by the III. / KTR 16. The surprise was successful, crossing the II. / JR 11 and II. / JR 32 was performed in total in 2 hours 40 minutes. The troops had the necessary ammunition and the rations for four days. The telephone connection was organized by immersing the field cable in the water. However, after a good start, many difficulties arose. The Malm Detachment attack was unsuccessful, a very favorable position was lost on the east side of the river and considerable time was lost. All this contributed to the fact that the ongoing Group F operation did not lead to full success. The performance of the Vuokko Detachment in Melkajanlahti, progressed slower than expected. The ground march was extremely difficult for the transport. The speed of advance of the troops was approximately 1-2 kilometers per hour. Progress was also hampered by the fact that behind the broad water course the detachment was vulnerable to empty spaces and, therefore, had to take the time and strength to carry out extensive security and clean-up operations. For the first day of attack, II. / JR 11 and II. / JR 32 arrived at the stream that descended from Ruokojärvi to the west. On the morning of July 15, the objective was to conquer the hills on the eastern bank of the river, in Oinasniemi. During the day, it reached the mouths of Ruokojärvi-Laskujärvi-Pistojoki. The enemy company, the 7./ RR 118, was dispersed. The Russians attacked on July 15 against the bridgehead of the III./ JR 11 north of the Vuoninen River. Some of the attackers stormed, but were destroyed. Several strong patrols attacked the northern wing of Malm on July 16, and the attacks were defeated. Again, on July 17, the bridgehead was attacked with powerful artillery and mortar support, but the III./ JR 11 rejected them all and caused extremely large losses to the attacker. At the same time the Vuokko Detachment advanced slowly. The enemy although flanked from the south still represented a difficult target, including pillboxes, south of the front. These positions in depth offered a hard resistance, suffering significant losses. Therefore, on July 17, 1941, only five prisoners were captured, but 120 were found dead and an important booty was taken. When the invading battalions reached firm ground in the sector of Lake Torasjärvi, on July 18 a Soviet counterattack broke out. After several hours of fire preparation, including heavy artillery, they were attacked from the north and in the peninsula south of Vuonninen towards the east side of Vuokatti. In a fierce four-hour battle, the attack was rejected in both directions. Probably, then, the Soviet leadership decided to leave the Vuonnisenjoki line, retreat to the station of Korpijärvi-Pistojoki, and thus the retreating forces were about to hit the Vuokko Detachment. On the afternoon of July 18, a large movement was detected in front of the Malm Detachment. The order to pursue was issued, but the action was not fast enough and even the forces that had to fix the enemy were not successful. The Soviet troops were only harassed by the Finnish artillery. The enemy needed to find a solution in the south so that the terrain between the Vuonnisenjoki and the Pistojoki was extensively mined off the roads and the roads were blocked at short intervals by barriers made of stones, the forests were set ablaze and artillery came into action. The next morning (July 19) at 09:00 hours began a strong artillery preparation against the Vuokko Detachment and at 09:45 the enemy launched a new and aggressive assault. Meanwhile, Battalion Sissi 3, Light Detachment 5, III / KTR 16, a cyclist company and a team of engineers were transported from July 16 to 17 through the water course and taken to the front line. The Russians still tried to save their position by renewing their attack at 11:30 hours, but to no avail. Finnish activities at the bridgehead were eased when a pontoon bridge was built on the Vuonnisenjoki before midnight from July 19 to July 20 until a field bridge was completed on July 23, 1941. The Vuokko Detachment moved actively in the direction of the Rivajärvi-Pistojoki Strait to destroy the enemy. On the afternoon of July 19 due to fatigue and lack of food, half of the troop was at rest. The losses after the battle amounted to 130 dead and wounded. The first line was then south of Lake Korpijärvi, 4 km south of the stream. According to reports, the prisoners of war belonged to Rifle Reg. 118 and 81. Due to the failed counterattacks, the Commander of the 54th Div. Tir. The Soviet Union began to doubt the durability of the positions in the Pistojoki and had decided to reorganize its defense closer to Uhtua. From the north in the direction of Pistojärvi, the III / JR 81 was retracted towards the Korpijärvi lake, leaving security in Pistojärvi in ​​charge of the border guards. He arranged a great defense based on the firepower to the west, from the south of Korpijärvi on the edge of Pistojoki, and south of Torajärvi to the headwaters of the pipeline leading east. Crossing of the Pistojoki River and the Battle of Korpijärvi - 21 to 25 July 1941. Colonel Fagernas issued an oral order on Monday, July 20, for the Malm Detachment about the attack the following morning. The intention was to cross the river taking advantage of an intense artillery fire. The artillery of the group led by Major Takkula opened fire on July 21. Around 02:00 hours unleashed a fierce fire support, approximately 3,000 grenades, that was accompanied by a very powerful fire of aircraft, armored and infantry weapons. At 04:00 hours, a bridge of war was launched on the stream. But the current was too strong and the bridge broke. In addition, the southernmost crossing also failed. Farther north the men of the I. / JR 11 hurried along with the regimental sappers on the island, moving on catwalks of logs. On the island, intense fire broke out, but the battalion unexpectedly advanced on another gangway on which the pioneers counterattacked again. At 04:40 hours, the assaulting forces reached the first foothills but crashed constantly against the enemy defenses. Finally a bridgehead of more than 500 meters was consolidated and the enemy was cornered in the north and the southeast. The situation became very difficult for the I. / JR 11. Lieutenant Colonel Malm, however, was quick to exploit the success and advanced the III. / JR 11 and Colonel Fagernäs quickly ordered the displacement of the I. / JR 32 towards the narrow bridgehead and began the expansion of it. The additional soldiers who arrived at the bridgehead were in a better position, along with the I. / JR 11 to repel the fierce counterattack carried out by the enemy. The enemy suffered extremely heavy losses and lost, among other things, 2 anti-tank guns and ammunition, 13 horses with their vehicles, 15 machine guns, 13 mortars and several automatic rifles. Thanks to this counterattack, the enemy, although at a very high price, also withdrew his troops in front of the Vuokko Detachment. The advance of Light Detachment 5 to the north could begin on July 21. At 03:30 hours a massive bombardment of the mortars was unleashed, to cling to the enemy on the right. By 14:25 hours the Malm Detachment had expanded the bridgehead about 2.5 km to the southeast, then Colonel Fagernas led the Light Detachment to the southern edge of Rivajärvi, where it should contact the III. / JR 11. Possibly parts of the enemy troops would then be blocked. At 19:00 hours the target was reached, but the situation had changed so much that the enemy had already withdrawn from the area. Lieutenant Colonel Vuokko sent Major Järvi on the morning of July 22 through the Sissi 3 Battalion, with the order to proceed with his light elements from the west of Rivajärvi to the north. The intention was then to direct the Light Detachment 5 east of Pinkojärvi and the Sissi 3 Battalion southwest of Pinkojo to intercept the Korpijärven-Uttua highway. However, Major Järvi, on its own initiative, marched at 04:55 hours toward a very difficult terrain east of Rivajärvi without contact Sissi 3d Battalion and 11:10 hours saw combat on the south coast of Pinkojärvi. Therefore the forces of Group F, on July 22 were deployed as follows: Detachment Vuokko with light Detachment 5 southeast of Pinkojärvi, Sissi 3 Battalion southwest earlier in the "hill two firs" and other battalions behind Rivajärvi and Pistojoki. The Malm Detachment was reinforced by the I. / JR 32 on the east side of Korpijärvi, II. / JR 11 behind it, and other German battalions and tanks astride Pistojoki. The group was no longer limited by cooperation between detachments. Light Detachment 5 rested for four hours at the southeastern end of Lake Pinkojärvi and at the same time conducted exploration and established an observation post. At 17:00 hours, Major Järvi received information about enemy activity on the Korpijärven - Uhtua highway, where troops, civilians and livestock were moving towards the east. At 18:00 hours the attack began. The road was cut and security posts were established both east and west. A few hours later the enemy sent reinforcements, and Major Järvi decided to leave and withdraw to the west of Rivajärvi, to the south. However, he was not successful in carrying out the stipulated withdrawal, but for a time was confused with the retreating columns of the enemy, which contributed to slow the displacement of Russian troops. Nice work. BTW it is Sissi Battalion 3 - Guerilla Battalion 3. Meanwhile, the situation around the Sissi Battalion 3 under Major Könönen was confusing. At 16:00 hours, the enemy began to move towards the sector first from the south, then from the west and from the east, which resulted in exchanges of gunfire and fighting. The telephone communication was broken. The situation seemed critical and a break was also planned. At nightfall the fighting began to decrease, and then the enemy probably moved to the east. On the radio, it was reported that an attack on the road was in progress. On the morning of July 23 at 08:00 a JR 11 patrol arrived to make contact. Of these cases, the information that came from the Group F Command was very late. On July 22 at 9:15 p.m., a radio message arrived from Major Könönen: "We are in the archipelago, the enemy presses, center, continues attacking". The Light Detachment 5 was withdrawn to the Vuokko Detachment until July 23 in the afternoon. This, of course, caused great difficulties in the conduct of the battle and also in the design of the bombings of its own air force. As soon as the message was received from the Sissi Battalion 3, the I./JR 11 was reinstated to Malm Detachment reinforced with two additional companies of the third battalion of the same regiment, with the task of attacking the route from the southeast. Only now there was an immediate cooperation between the Malm and Vuokko Detachments. The I. / JR 11 contacted the Sissi Battalion 3 and moved east. For a long time, Malm Detachment had the great disadvantage that enemy guns were firing from Pinkojoen's direction. Lieutenant Pentti Valkonen led the two companies of the I. / JR 11 to a surprise attack after a reconnaissance, reached the hostile battery, and managed to destroy it before being forced to retreat to its starting position due to enemy counterattacks. On July 22, medium tanks were transported in the direction of the road over the Pistojoki and received the task of attacking the highway on July 23. At 01:45 hours advanced supported by the team of sappers. In this difficult terrain the tanks were tied to the route and continued in line with the sappers behind taking advantage of their cover or partially forward. The detachment infiltrated the enemy positions and the sappers repaired the bridge in a fierce battle. The detachment fought for more than two hours and reached 400 meters from the enemy positions, but when one of the tanks was destroyed by a 45 mm cannon and the sappers lost their officers, the detachment retreated to the starting line. The transfer of the heavy company (Pz Kw III Ausf. H / J failed when one of the tanks fell into the water from the pontoon, however the trans-shipment of light vehicles continued without interruption and intensified. With the enemy shifting their forces and equipment continuously and almost without interruption to the east from Korpijärvi, and when Group F had managed to gather a strong reserve to accomplish the task, Major General Siilasvuo issued the order on July 23 at night to Cut the road the next night. Colonel Fagernas issued his order on July 23 giving command of the assault forces to Colonel Malm reinforced with the Light Detachment 5 and placing the Vuokko Detachment as reserve. Under the direction of Major Ranisen, the attack of the I./ JR 11 and the Sissi Battalion 3 on the road started at 18:00 hours, and at the same time also jumped out the connection attack of the I./ JR 32 towards the road after of the artillery preparation. Before that, the bombardment of German aircraft on the enemy's rear had taken place at 16:00 hours. The final phase of the fierce battle of Korpijärvi began on July 23. In the heat of the afternoon, the increasing amount of smoke from forest fires made it difficult to see and breathe. The attack that began at 18: hours was disorganized when the division commando received intense and well directed artillery and mortar fire, in which 6 officers and dozens of men lost their lives. The forest fires spread rapidly and threatened, among other areas, the meeting area of ​​the Sissi Battalion 3. Only with great efforts was the fire contained in this direction. The start of the attack here was postponed. There was no attack on the road. The troops were retreating due to the heat and the previous unsuccessful assault attempts. The enemy could have received a strict order to maintain his position in order to allow time for the formation of new defense positions. Colonel Malm sent Light Detachment 5 to cooperate with Major Ranisen and brought from the reserve Major Veijola and the II./ JR 11 in the direction of the front line on the road and relieved the worn troops in that place. On the still warm July 24, the attack finally began at 06:00 hours in both directions. Behind the forest fires, the smoke prevented the use of aviation and the visibility of the terrain was a few tens of meters. The enemy had retreated its troops to the rear, but still defended itself firmly. Around 09:00 hours, the detachment reached the road, cut it and destroyed, among other things, two small tanks. Major Veijola had already reached 500 meters ahead of the road this time, and by 11:00 hours he had already reached 1.5 kilometers on a very difficult and deep terrain. The artillery fired on an enemy trapped in the narrow terrain. A captured enemy chief reported that on July 21 the III./ JR 81 had been transferred to Korpijärvi from the Pistojoki line. The ring closed. Parts of the enemy managed to leave the bulge, but many dead were left in the field. The situation was resolved in the late afternoon of July 24. Colonel Malm ordered that the pursuit of the enemy rearguard continue and he took charge of all the forces that were engaged in combat. Lieutenant Colonel Vuokko was in command of the I./JR 32, II./JR 32 and the 25. Company of border hunters. Colonel Malm organized, among other things, the JR 11 hunters' teams, which Captain Ylönen led 1.5 kilometers south of Pinkojo, attacking the enemy and rejecting them across the river despite the fierce resistance on July 25, at 08:00 hours, and entered Sillanpää. The bridge was blown up by the enemy. Because of that situation, Captain Ylönen stopped. The II. / JR 11 advanced and extended a mile deep from Sillanpää. By order of Group F the Vuokko Detachment, relieved the exhausted troops of the Malm Detachment, starting on July 25 at night. In the climate of Korpijärvi, the enemy was beaten and partially destroyed. The booty of war included 5 armored vehicles or small tractors, 2 armored vehicles, 10 anti-tank guns of 45 mm, 12 grenade launchers, 19 machine guns, 95 light weapons, hundreds of semi-automatic weapons, almost 400 rifles and more. In addition to taking into account the losses suffered by the enemy in previous battles, it suffered a very serious defeat in this direction and lost his important defensive position. Group F had made extreme efforts and suffered substantial losses. According to the opinion of the III. Army Corps, on July 25, 1941, operated in the Uhtua area the 54th Russian Division, commanded by General Gushevski or General Panin. The division consisted of JR 118, Commander Lieutenant Colonel Rossohin, JR 81, Commander Lieutenant Colonel Derzhavin or Grilov, KTR 86, Major Znamenski, Border Guard of Uhtua, Colonel Levi and possibly Department of the Party. The JR 118 had been in Uhtua since before. The JR 81 was transferred there from Kemi in June, and subsequently to Vuonninenjoki. The KTR 86 had also marched from Kemi to Uhtua on July 9. When the III / JR 81 on the north of Lake Pistojärvi was moved on July 21, due to the critical situation, to Korpijärvi, all the troops of the 54th Division participated in these battles, with the exception of the Border Guards and the Partisans in the Pistojoki-Röhö area in the north, as well as in the southern part of the Jäälahti Bay. In their defensive positions, the Russian infantry fought very hard, which meant that the Finnish invasion between Vuokkiniemi and Korpijärvi broke continuously in almost all the terrain with defensive positions. Russian artillery and grenade launchers proved to be very effective in forest battles, especially when they attacked aggressor groups and troops. On the other hand, the activities of its air force were diluted and quite fragmented, in spite of several very advantageous objectives, and the cooperation between its ground and air forces did not seem solid. Group F continued its attack on Uhtua on July 26, 1941 led by the Vuokko Detachment. This, in turn, sent as vanguard through the virgin forests of the eastern side of Lake Eldankajärvi the III./ JR 32. To prevent the enemy from retreating and annihilating it, Group F cut the road at Lake Eldankajärvi. With the battalion of the front, with the Light Detachment 5 and the II./ JR 11 that was in reserve, the Veijola Detachment was formed. Difficult terrain and forest fires put a brake on the march of the battalions, the formation of the detachment and the start of operations. On the morning of July 30, the Veijola Detachment started attacking on the road, at 08:50 the Light Detachment 5 on the right and the III. / JR 32 to the left, after which the II./ JR 11 cleared the gap. During the morning, fierce battles were carried out with the enemy, who, among other things, tried to open the road with the support of armored vehicles. At 12:00 o'clock sharp, the Vuokko Detachment contacted the Veijola Detachment and the remaining hostile battalion was almost completely destroyed. Some retreated through the woods to the northeast after the survivors had surrendered. Among other materials, two field guns, two anti-tank guns and horses were captured. The reconnaissance had determined that the enemy occupied strong positions in the Lake of Kiiskisjärvi, reason why the Group F decided to continue its assault on this lake as much to the north as to the south. 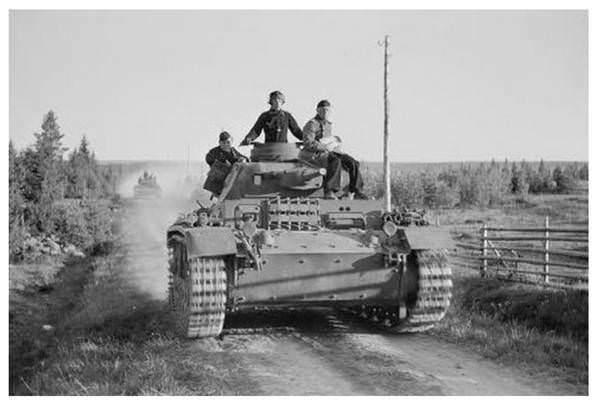 JR 11 (less the 2nd Battalion), reinforced with the Sissi Battalion 3 was assigned to move north and east of Kiiskisjärvi and cooperate with the JR 32 to destroy the enemy in the lake. The attack began on the morning of August 2, but stopped almost immediately in the face of strong enemy resistance. In the afternoon, Captain Mariston's III. Battalion, was bombed and Colonel Malm sent the I. Battalion to help the comrades, with machine guns and mortars, and the II. Battalion, which was still in reserve, to surpass enemy positions. On the morning of August 3, the enemy launched a powerful counterattack, which was rejected. The JR 11 once again attempted to attack with the I. and II. Battalions and with powerful artillery support, but again he was stopped by persistent resistance. The regiment had lost 97 men for two days and reached the northern tip of Kiiskisjärvi, where the first lines remained until the end of the war. On the main road southwest of Kiiskisjärvi, the JR 32 achieved only a local success and, in the central direction of Kuittijärvi, Light Detachment 5 reached Tsirnijärvi. The defense of the Soviet troops was strengthened and the inflection point of the battle in the direction of Uhtua was achieved. According to the directives of the German Army Command, the effort was shifted towards Kiestingin - Louhen. Group F began to weaken its forces according to the new effort from August 02 onwards, although the group needed only the attack of a regiment to take Uhtua. Group F, which as of August 17 became the 3rd Division, continued its efforts to seize Uhtua through the open northern wing. On August 09, an attack was organized, which originally had to include four battalions. Meanwhile, preparations had to be made to detach more forces in the direction of Kiestingin, for which the Malm Detachment was composed of the I. / JR11, III. / JR32 and Sissi Battalion 3. Transfers and other preparations took time due to rainy and bad road travel, German tanks and tractors had to tow trucks and guns through the softer terrain. On August 15 began the attack northward of the road leading to Uhtua, and the I. Battalion commanded by Captain Halonen approached the intersection of roads leading to Malvia and Röhöö. The III. / JR32 continued to attack on August 19 supported by tanks, but was stopped a few miles from the creek south of the crossroads. The I. Battalion, commanded by Captain Maristo after Captain Halonen was wounded, also went to the stream line and the battalion received on August 24 the order to take control of the dominant hill west of the road . The attack advanced with the support of the artillery, through the forts and mines, and the next day the southern slope of the height was reached. Four days later, a forward base on the west side of the hill was captured. For this purpose a Finnish-German attack division was formed, supported by eight tanks and artillery fire. The defense was very tedious, and some of the pillboxes had to be silenced by rolling over them with the tanks. When it advanced more than half a kilometer, the enemy broke down, and the forces of the Infantry Regiment could be advanced. In the first days of September, an attempt was made to attack Uhtua from the northern sector of Sakulla, led by Major General S. Tenhunen, Head of the 3rd Division Headquarters. The attack was carried by JR 32 (minus III Battalion); from JR 11 the command, the mortar company and a company took part. In addition, the 2nd / Sappers' Battalion 34 and the German Armored Company Walter were subordinated to the Division. The Infantry Regiment 11 also had the task of supporting the assault on the ground, and for that purpose they were added cannons. The attack began on September 1 in the morning. The German armor was left behind due to difficulties with the terrain. The detachment proceeded without encountering the enemy until 15:00 hours, when it reached the Malvia route. During a brief and fierce shooting, the Soviets turned their artillery and began shooting at close range. The attack stopped and the units retreated under cover. The Sakun Detachment was organized to continue the attack, but the action was delayed by enemy pressure. At night, Major Tenhunen decided to suspend the attack because of the darkness. On the morning of September 2, the Russians attacked the road in the direction of the Olluta company, which dispersed. The lost positions were restored, but at 13:45 hours a fierce attack supported by artillery began, in which the Sakun Detachment battalions were dissolved and Major Tenhunen disappeared. The Finns were assembled, but since they were no longer able to attack, the entire detachment returned to the initial positions. The losses were relatively low; Two or more reinforced battalions had lost a dozen men. In the JR 11 the mortar company lost the baggage and the ammunition deposit had to be blown. On September 4, Colonel Fagernäs decided to move to defense. The position achieved was occupied by Light Detachment 5 in the south and the JR 11 on the roads leading west and north to the Uhtua River, as well as between them. On the main road, south of Kiiskisjärvi, about 3 km wide was the II. Battalion of Lieutenant Colonel Veijolan. The complete left wing from Kiiskisjärvi to the Malvia highway was occupied by Lieutenant Colonel Ranisen's I. Battalion. This unusually long line was distributed in December with the III. Batallón of Major Haatajan positioned in "Horseshoe". During the rest of the year, there was a lively operation of reinforcement and artillery in the position of the regiment, and occasionally minor attacks were made on both sides. The position was too extensive for the regiment; it was more of a thin curtain rather than a defensive line. However, the situation that had arisen was dictated by the deployment. In Uhtua's direction, it had to be maintained with minimal force. On the other hand, it was necessary to maintain the defenses in the east for the time being, since when closing the Malvia road, the position was protected from the Kiestingen side. When the army's focus moved to the Kiestingen - Louhi sector in August, Group J, which was fighting there, was reinforced by two battalions of Group F, Sissi Battalion 3 and III. / JR 11. The latter arrived in Kiestingen on August 24, transported in vehicles in a very difficult situation. The 88th Soviet Rifle Division had started a strong counterattack earlier this week, which had stalled and was partially rejected by the strongest attacks of JR 53. Over the next few weeks, the III. Battalion participated in ongoing battles, which were necessary to clear the crisis in Kiestingen. On August 24-25, the battalion attacked the position of the railroad with the Sissi Battalion 3, but the companies stopped before the enemy's fierce fire. The battalion was forced to wait for darkness to fight against this land of death without suffering serious losses. On the first day of the battalion, the commander of the battalion, Captain Pellikka, was wounded and his replacement was Major Haataja. On September 8 and 9, the Battalion carried out a counterattack against the enemy that broke into Hangasvaara and managed to capture seven mortars, flamethrowers, four machine guns and 20 light weapons. The battalion returned to Uhtua to its regiment on October 11, when the situation in Kiestingen had calmed down. Colonel Malm was transferred to Kiestinki on October 9 and a new commander was appointed to JR 11, Colonel J. S. Wallden.